I love the Fourth of July! Don’t you? It makes me think of green grass, picnics, barbeques, hot dogs…What’s stange is I totally know how hot dogs are made and yet I still love them. But I digress. My favorite part about the fourth of July is the flags! Seriously. I have a thing for Old Glory. 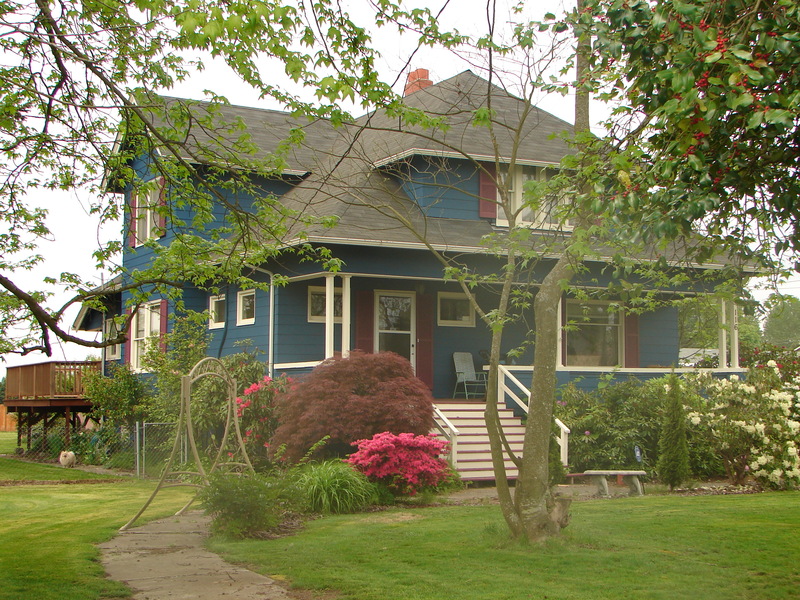 I even painted my house red, white and blue. Seriously, it used to be pale pink! 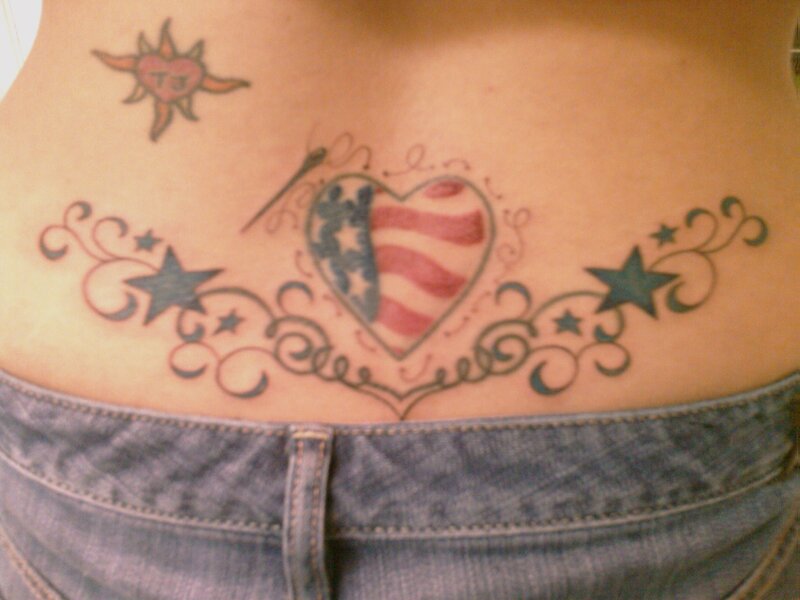 And if that wasn’t permanent enough for you, I inked myself up with some American (and quilting!) pride! Yes, that is totally my tramp stamp. Don’t judge! And yes, that’s a needle and thread around my American Flag heart. 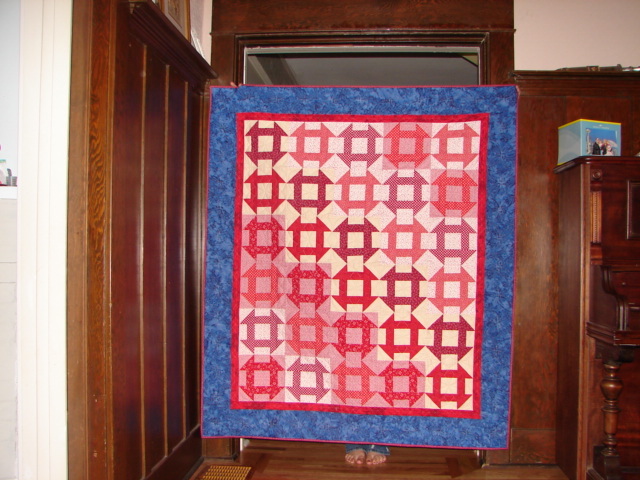 Which brings me back to why I’m writing in the first place: Red White and Blue quilts!! The quilt above is one of my very first quilts. I had this vision in my head of a flag quilt and I set out to make it. I was so new to sewing, a complete novice, but I wanted to design it, create it and have it finished by Independence Day of 2000. The great thing about not knowing how to do things “right” is that you don’t know you’re doing them wrong! I had a blue fat quarter that screamed of needing stars! It already had glitter in it after all, so I eyeballed it, cut it, traced and cut 50 muslin stars, placed them on my sea of blue, zig zag stitched them mostly on, stuffed them, then zig zag stitched them closed! The stripes were also a spontaneous design. I pieced two different 2″ (or so) strips together, then cut them into 2″ (or so) segments. Little did I know the REAL patterns would be requiring me to do this for years! Yay me! I was advanced. I discovered that if I matched the bottom left and top right quadrants, the effect was pretty cool! I did that until…well, until it looked right. But that was about my only reasoning. I was pleased with myself when it came out looking like waves! Once I had the completed top, I needed to finish it! It was a pretty impressive top for a novice 20-year-old with no pattern! (*not that I would have done the pattern right!) All I knew how to do at the time was pillowcase quilts, and attaching satin borders to baby quilts. I was completely unaware of the phenomenon of “binding”. I pillowcased it, used remnant batting and stitched-in-the-ditchish. 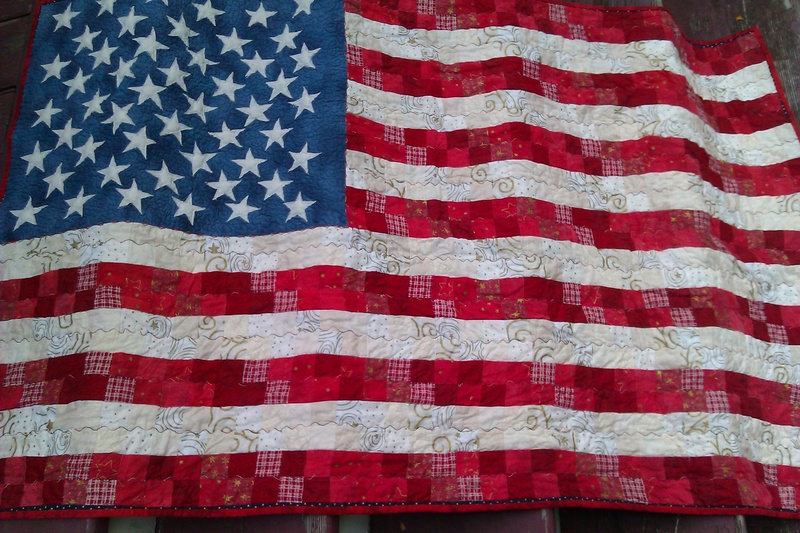 The finished quilt was not as impressive as I had hoped, but I was still proud of my scrappy, 57″ x 37″ piece of America! I proudly displayed it on my walls for years! And then I started quilting. Really quilting. My sense of pride in this piece began to diminish. In my new-found experience, I began to see glaring flaws in my once beautiful quilt. I had disgraced my flag! I couldn’t bear it anymore and took it down from the wall, folded it up and put it away. A couple of years ago I mustered up to courage to revisit this quilt. I tore it open, ripped out my quilting, I bought new backing (A beautiful Moda flag print, Red, White and Bold, the only boutique quality fabric in the quilt at that point! I was such a newb!!) 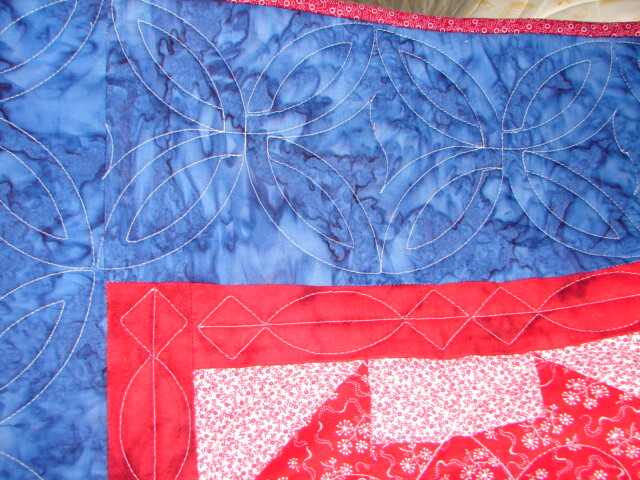 heavy red, white and blue variegated thread and set off to finish this quilt right! The thread was so heavy and was awful to deal with, even on the Bernina! But I did it. I stippled the blue and used a wavy stitch in each stripe. It is hand bound in my favorite red RJR fabric. I finally have made this quilt the way it was supposed to be! Now, 11 years old, long may she wave! Holy hell! Look at that quilting!! Did I seriously make that?! If this isn’t a testament to having quilts long armed, I don’t know what is! 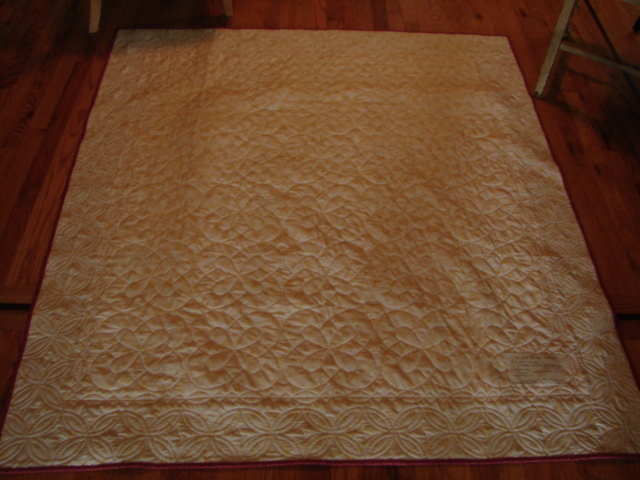 Her quilting took my average quilt and made it incredible! I was SO PROUD to donate this! Granted, I did want to keep it, but JUST FOR A SECOND! I made a matching pillowcase and sent it off. Goodness, I sure do love that quilt. 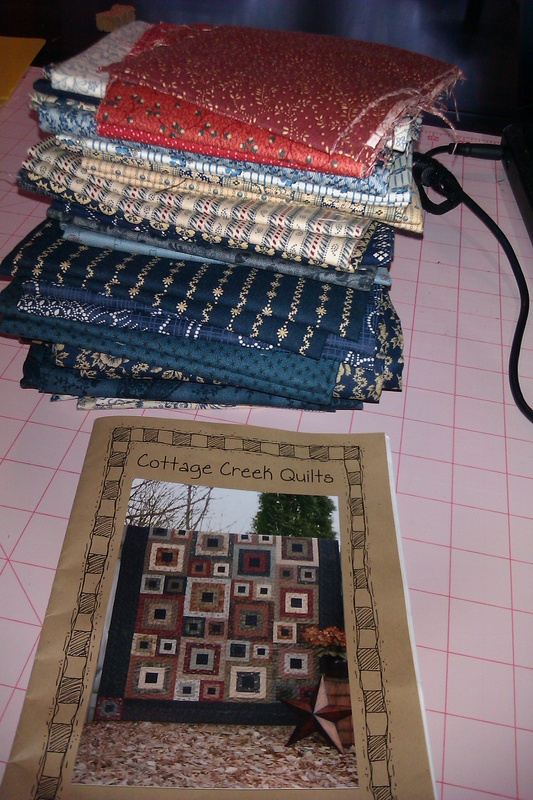 Anyway, among my myriad of other quilts-to-be-made is another red, white and blue. I got the kit as the replacement for a shabby chic kit I’d had for years and made for my sister. I would like to think I’ll have it finished by next July 4th. Stop laughing! I’m serious! 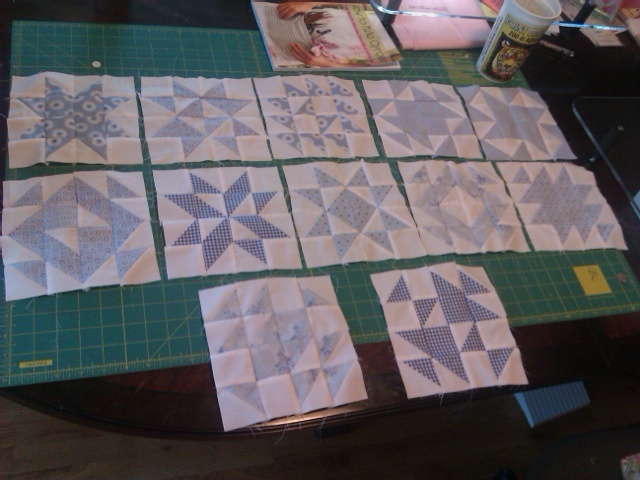 July 4, 2012 quilt...I promise. Now hold me to it!! In other news, I have finished all my Buck a Blocks from 2009. (Shut it.) And am working on finishing them up. I hope to have all finishing blocks done tonight. Currently I have 2 done…only 10 to go! Seriously! I’m going to finish them! Ask me about it tomorrow!! 12 7.5" buck a blocks...They'll make into a king size somehow...? Should you deem my millenium Quilt worthy of a vote, it is competing in the Patriotic quilt contest this week (starting Friday, 7/1) over on the Quilting blogger’s Directory! Thanks so much! And Happy Independence Day, America! !